WILLIAMS, Ariz.— The Springs Fire in Arizona’s Kaibab National Forest reached 6,287 acres Monday, traveling into Wild Horse Canyon and drawing nearer to perimeter boundaries established by fire managers for the benefit of the forest’s ecosystem. Fire managers expect the lightning-caused wildfire to reach its pre-established southeastern boundary within the next several days. Sunday, fire personnel monitored increased fire activity due to drier conditions following a week of monsoon weather. Crews reinforced Forest Road 746, a designated perimeter road, with burn-out operations. Monday, fire personnel monitoring the fire reinforced Forest Road 57A and Forest Road 746 as fire activity moved slowly towards the south around Wild Horse Canyon. 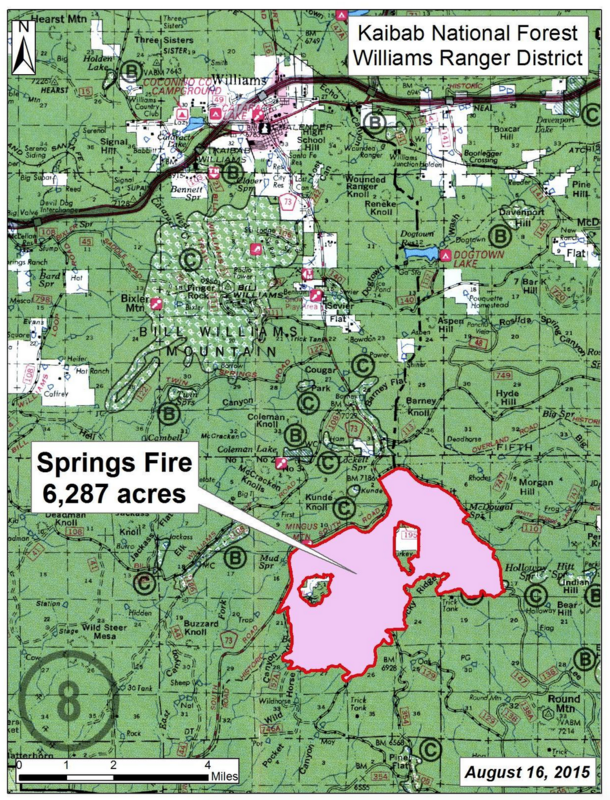 As the wildfire reaches these designated perimeter roads, it is expected to burn out on its own, as fire managers have been planning since the discovery of the naturally-ignited Springs Fire July 2. Smoke impacts to both Wild Horse and Sycamore canyons and farther south are possible as the Springs Fire continues to slowly back through the area. The Parks and Bellemont communities may also notice smoke over the next several days, as the wildfire burns naturally through the remaining portion of the planning area. As the wildfire reaches predetermined perimeter roads in the coming days, fire activity and smoke production are expected to decrease significantly. The Summit Mountain Trail, No. 68, continues to be closed until Sept. 30 or until Closure Order 07-15-01-F is rescinded. The trail was closed July 30 because of Springs Fire activity.